Habit: Erithalis diffusa grows as a lax medium shrub to 1 m in height. The leaves are arranged oppositely with paired rounded stipules at the petiole base. The leaves are to 7 cm in length, round, oval an entire margin and a round leaf apex and tapering along the petiole at its base. The leaves are primarily occurring at branch tips. The actinomorphic, perfect, complete flowers are arranged in panicles. There are 5 partially fused greenish sepals in the calyx. There are 5 partially fused white petals in the corolla. There are 5 stamens. The ovary is inferior with a single locule containing 2-3 seeds. The fruit is a berry that is dark purple/black at maturity. Habitat: Erithalis diffusa grows primarily in coastal Dry Broadleaf Evergreen Formation –Shrublands (scrublands) on sand substrate and along dune systems. Distribution in Bahamas/Globally: Erithalis diffusa is an endemic species occurring only in the Central and South Bahamas. 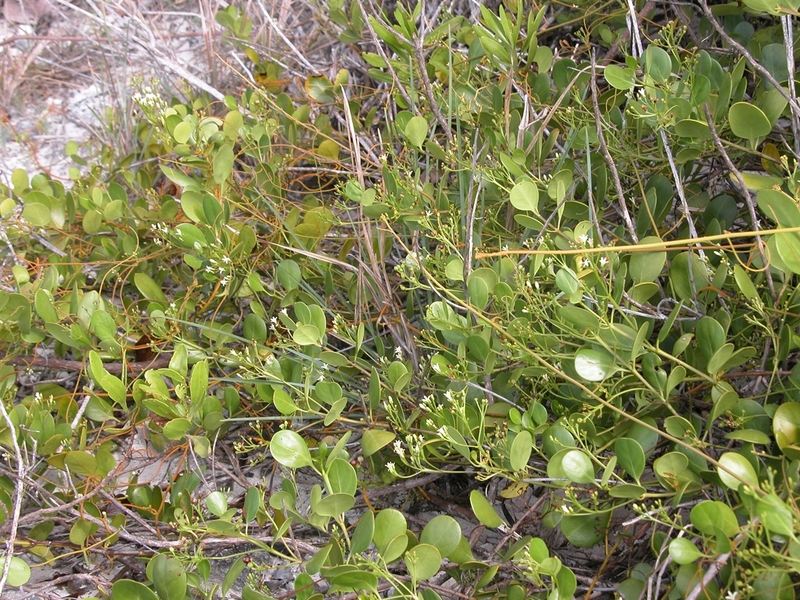 Medicinal/Cultural/Economic usage: Erithalis diffusa is not used medicinally in The Bahamas.